David: I have been getting some lovely comments about our conversation from people who have been watching it unfold. 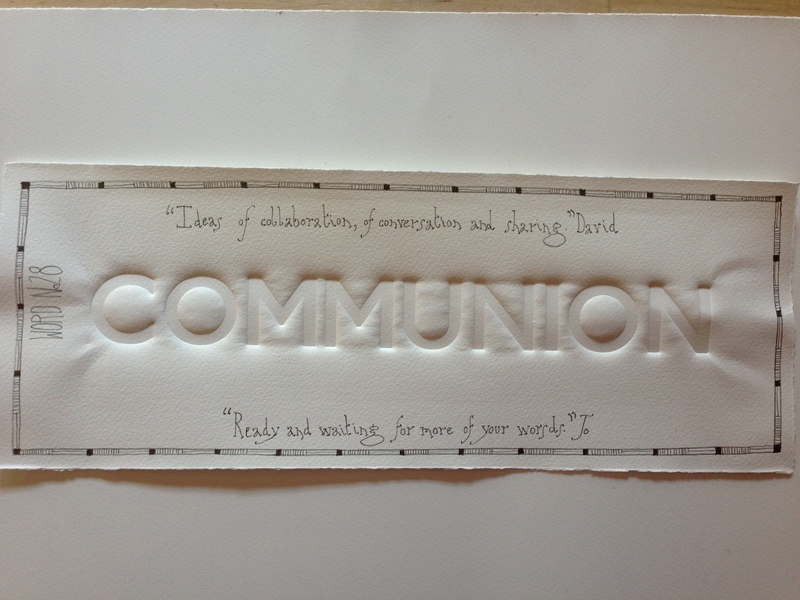 One of them today described it as: ‘A real communion, a real sharing.’ That use of the word, made me think about it. Suddenly it became stripped of all of the usual trappings I associate with it. The word was new and naked and back to being about deep exchange and common participation. How it was so apt, this big room of a word that has space to hold ideas of collaboration, of conversation and sharing between us being part of a bigger conversation with everyone who sees it. Sometimes our heads are so full of language that words get buried until we unexpectedly find them again, pull them out, polish them up and give them a good spot in the sunshine. Jo: Te he, at times I am finding this conversation quite spooky, each day I think ‘what is he going to send me today, what if I have nothing to say back?’ And each day your words seem to hit a sweet spot – and I’m off! So, I have just come in from the Press Room, where I press your words. I have been giving it a much needed tidy up for Warwickshire Open Studios, where our conversation will be on display to a different audience. The font that I am using for the embossing is Gill Sans. I have been fortunate to work a lot at Ditchling Museum in Sussex where Eric Gill lived for a while. After 28 words the tray with this type in has got rather mixed up, so what have I been doing? Why, finding them again, pulling them out, polishing them up and giving them a good spot in the sunshine! Ready and waiting for more of your words. This entry was posted in 50/50 and tagged collaboration, conversation, Ditchling, Eric Gill, words. Bookmark the permalink.